During a side event of COP21 – December 7 in Paris ICLEI and its partners provided an update to the UNFCCC negotiators with the achievements of the Compact of Mayors and created a dialogue to explore options for enhanced engagement of local and subnational governments in raising the level of ambition and accelerating climate action at all levels based on the outcomes of the COP21 in Paris. November 30, U.S. Congressional Progressive Caucus introduced a House Resolution calling for near-zero greenhouse gas emissions by 2050, generating 50% of the country’s electricity from renewable sources by 2030 and transitioning to 100% renewable energy by 2050. 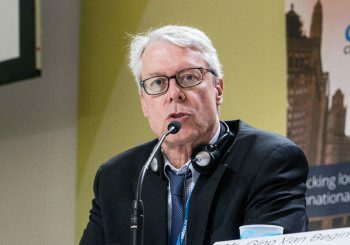 ICLEI co-hosted a delegation of mayors and local officials called the Local Climate Leaders Circle for one week in Paris, and hardly a moment was lost. 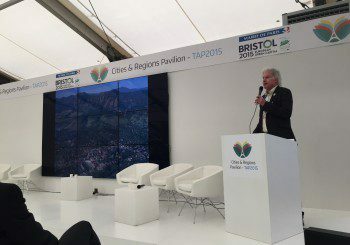 From panels to summits to bilateral meetings; with Senators, Cabinet officials, and mayors from around the world; in the “Blue Zone” to City Hall and everywhere in between – the Leaders Circle represented US local governments admirably, and the partners ICLEI, NLC, WWF, and USGBC could not be prouder. 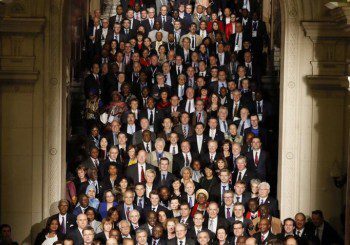 In the end, the US boasted the largest delegation of local officials of any of the almost 200 nations in Paris, and they made their voices heard. 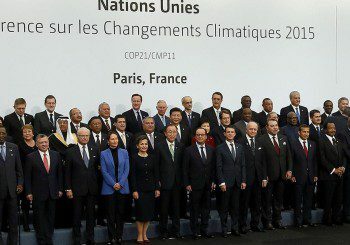 The 21st Conference of Parties represents the biggest opportunity for agreeing on an international climate framework in many years. After years of preparations, it is almost certain that some agreement will be reached – but the strength of the agreement is an open question. Local officials have a key role to play in showcasing solutions and inspiring and advocating for an ambitious approach. The World’s Community Inventory Tool at No Cost to Cities! 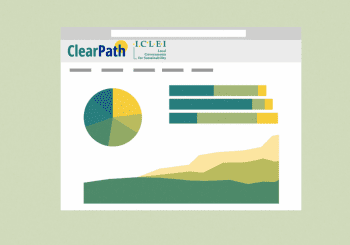 ICLEI USA’s ClearPath is an all-in-one suite of online tools to complete GHG inventories, forecasts, and climate action plans at the community-wide or government operations scale. ClearPath Basic, which includes the Community Inventory Module, is now freely available to all local governments worldwide in support of the Compact of Mayors. 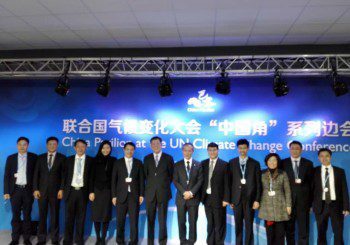 ICLEI Local Governments for Sustainability and Shenzhen Low-Carbon Development Foundation signed a Memorandum of Understanding (MOU) at the 21st annual meeting of Conference of Parties (COP) in Paris. The climate collaborative agreement stems off of the Parties shared and firm belief that a clean environment and a strong economy can co-exist, and clean energy technology is one of the key paths to ensuring a clean environment and a prosperous future. 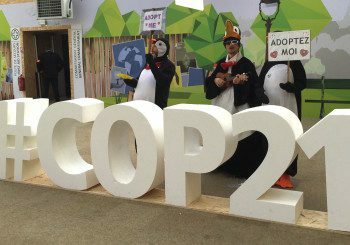 Today in Paris, four transformative U.S. climate projects took stage at COP21. Moderated by ICLEI USA Efficiency and Renewables Director, Angie Fyfe, the panel included Boulder Colorado’s resilience project and three California projects: transport in Santa Monica, Community Choice Aggregation of renewables in Richmond, and carbon sequestration in San Francisco. 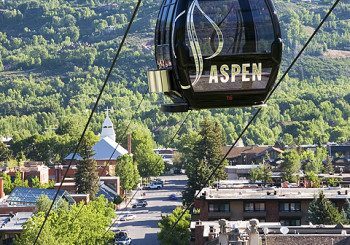 We continue our blog series with Aspen, CO, a long standing climate leader and forward thinking community. We sat down “virtually” with Chris Menges, Data Research & Project Planner for the City’s Canary Initiative to learn more about the City’s climate and sustainability goals as well as his experience with ClearPath. 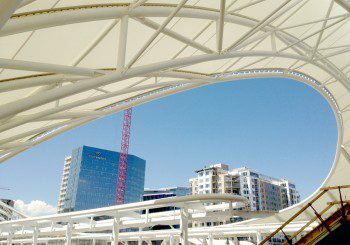 ICLEI USA is pleased to announce that Denver is the first U.S. city to join the Global Lead City Network on Sustainable Procurement. Congratulations to Mayor Michael Hancock and his team for their leadership in linking up with Seoul, Cape Town, Auckland, Rotterdam, and others and their acknowledgement that good procurement takes into account social, environmental, and economic impacts.